Tenth-grader Ashley Ulmer made a discovery Wednesday that brought a North Dakota paleontologist running. Ulmer, one of about 30 Bismarck high school students who participated in a fossil dig, found the jaw of a 60 million-year-old mammal sticking out of the dirt. It was a significant find for North Dakota Geological Survey paleontologists, who said finding a complete mammal jaw is rare. “That very well could be the find of the week,” said senior paleontologist Clint Boyd. 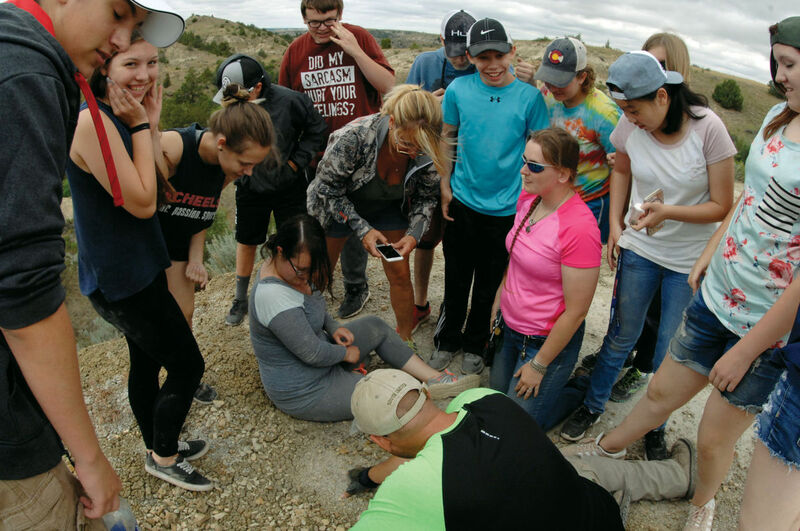 The students from Century and Legacy high schools joined the paleontologists for a field trip near Medora for their summer biology classes. “It connects to everything we’ve been learning all throughout the summer,” said biology teacher Andee Woodmansee. Ulmer, a student at Century, said she decided to look for fossils in an area away from the rest of the group when something caught her eye. She brought Boyd over to take a look, who identified it as the jaw of a mouse-sized mammal. Paleontologist Jeff Person, who ran from the opposite side of the dig site to check out the fossil, said they’ll put it under a microscope to determine what type of mammal it is. 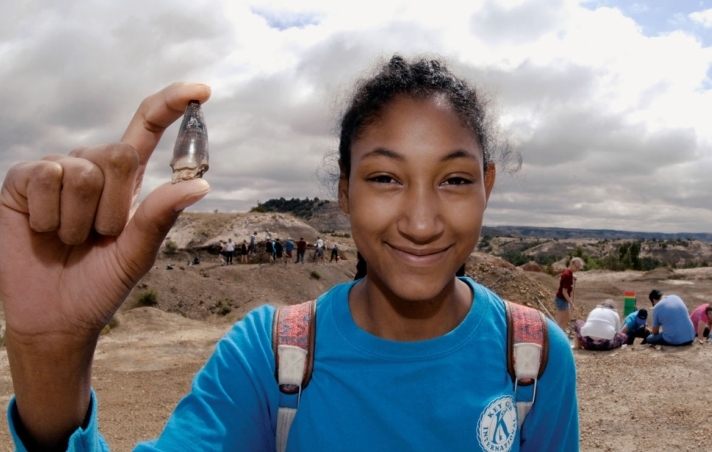 Earlier Wednesday, sophomore Simone IronBoulder from Legacy High School found a crocodile tooth that was about 1.5 inches long. “That might be the biggest tooth we’ve ever found out here,” Person said. The fossils are from the era right after dinosaurs went extinct when the environment in North Dakota became swampy. The mammal jaw will help paleontologists determine a more precise estimate of the age of the fossils. Cameron Brown, a student at Century, said he didn’t realize before the dig that North Dakota once had crocodiles. Students also found several fish vertebrae and mussel shells. “We’ve been finding fossils pretty much everywhere,” Brown said. For the rest of the week, members of the public will continue helping paleontologists at the site, one of four public fossil digs the Geological Survey is holding this summer. 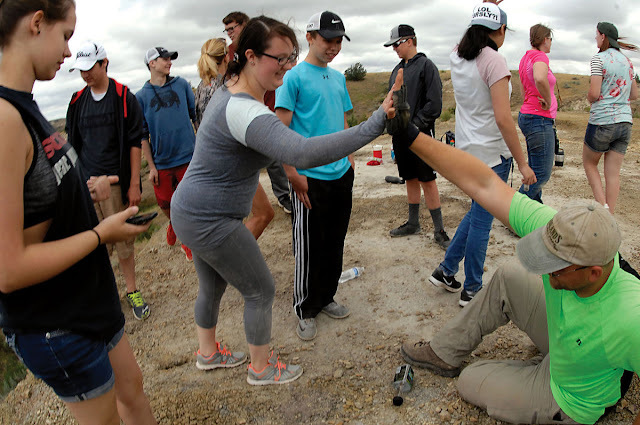 Responses to "60 million years old: Bismarck students find rare fossils during Medora dig"